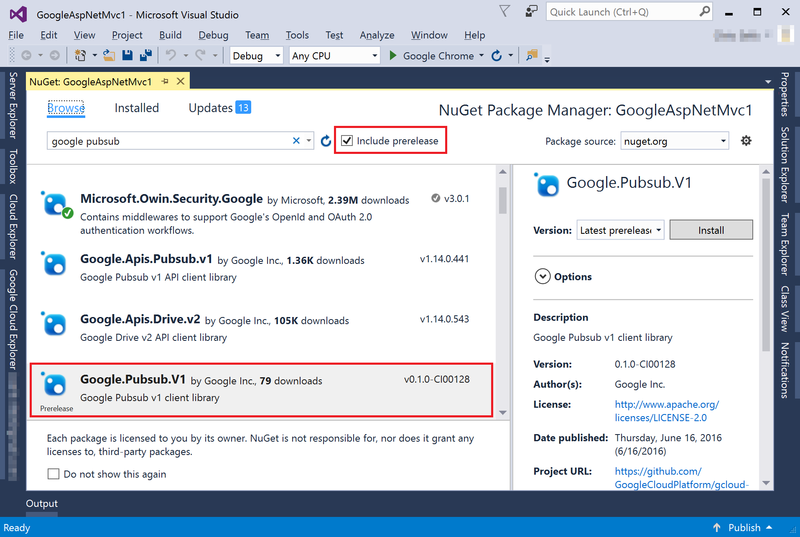 All Google APIs are available to .NET developers through the NuGet package manager. Before searching make sure Include prerelease is checked to show all Google Cloud Platform libraries. Note: Some of the libraries listed are Beta. Enter a search string, for example google pubsub. Results with a Google.Apis prefix are NuGet libraries that are available for all Google APIs. Here is the complete list. Here is the complete list of these Beta libraries. We recommend using these libraries if you are comfortable with their pre-release status. These libraries are being actively developed as open source, so we invite you to contribute if we’ve missed your favorite features.